The award-winning Light Up Eau Claire New Year’s Eve celebration is quickly approaching on Sunday, Dec. 31. The event – which is produced by the cultural tourism committee of Visit Eau Claire and sponsored by Royal Credit Union – will include two lighted lantern parades (an early parade for families with young kids and a late parade to officially ring in 2018), multi-venue live entertainment, a gala at The Lismore Hotel, outdoor activities, and a fireworks show. The event is inspired by Eau Claire’s sister city, Lismore, Australia, where the winter solstice is celebrated with a lantern parade and bonfires each year. 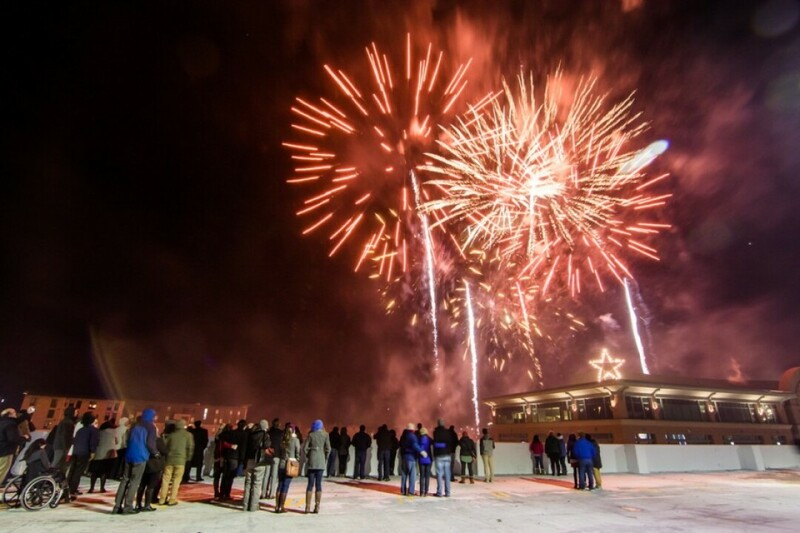 “Light Up Eau Claire New Year’s Eve will be an evening of fun with family and friends,” said Linda John, executive director of Visit Eau Claire. It culminates with a lighted lantern parade at 11pm, fireworks at midnight, and official celebrations continuing until 1:30am. All proceeds go to the Confluence Arts Center’s operating reserve funds. The inaugural event last year resulted in Visit Eau Claire receiving the Wisconsin Association of Convention and Visitors Bureaus Trailblazer Award for the Outstanding Partnership. In addition to the parades and fireworks, this year’s event includes daytime activities at the Children’s Museum of Eau Claire, free movies at Micon Cinemas, Rockin’ the Rootop fireworks viewing party at the Riverview Terrace municipal parking ramp, Leinie’s Ice Lounge in the Barstow Street parking lot, commissioned ice sculptures by local artist Jason Anhorn, and a specially commissioned life-sized lantern made by local artist Pam Rindo.